In the last couple of weeks I have lectured this year's intake of Computer Science undergrad and postgrad students at Loughborough on Cloud Computing - the challenges it poses and the opportunities it creates. If you're interested, please see below for my slides. This blog post looks at some of the issues I raised in a bit more detail, and in a way which I hope will be interesting to both attendees of those lectures and readers from elsewhere on the net. Please do leave a comment and let me know what you think. So, where to begin? Well, like many organizations we're revising and updating our IT Strategy in the light of recent world events, demographic changes, and (in our case) the particular challenges of the higher education environment. For me there is a particularly interesting question about the intersection of cloud computing and the "Post PC" concept. We could say that Steve Jobs was (at least publicly) on a crusade to make your computing experience a productive and pleasant one, though tightly integrating hardware and software. A cynic might say that this was purely a marketing ploy, of course. The continued success of the iPhone and iPad suggest that the world was ready for such a thing - or the Reality Distortion Field _really_ works. As I've blogged before, my own view is that iOS gives us a computing experience that finally feels as though we are living in the 21st Century. As Steve Ballmer notes, Google are in some ways hedging their bets by promoting both Android and ChromeOS. It is easy to picture that the two may eventually come together, in the form of a version of Android that has local app management (potentially) done via the Google Apps admin control panel, or on which local apps can be disabled entirely for an experience analogous to today's Chromebook. Both "operating systems" are based on the Linux kernel, and Android is widely expected to move to the Chrome browser in its next major revision. However, right now there is much of interest that can be done purely with ChromeOS. The PC is dead, get over it. And it’s not what you’re thinking – the PC is dead, but not because of the iPad. It’s dead because PC manufacturers are finding it more and more difficult to put together a marketable proposition that actually makes them any money. The margins on the PC business are so wafer thin that even HP, number one or two in most markets, has been thinking seriously about exiting the business. This isn't a minority view, either, even the designer of the original IBM PC feels that the PC era is over. To understand just how poor the margins are on PCs, consider this article from the Guardian Technology Blog, from which I've clipped the image below. 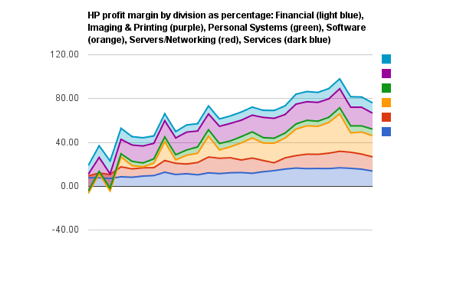 The green bar is the profit brought in by HP's PC division, roughly $40 for an $800 PC. Sure, in five years’ time you’ll still be able to buy something recognizably PC like, but that will be a workstation for a power user, not a generic desktop box – something more like today’s Mac Pro or Dell Precision. Expect it to cost significantly more than today’s “beige box”, as the remaining vendors attempt to extract some profit for their shareholders. Hopefully this will also end the race to the bottom that has characterized hardware quality in recent years. This doesn’t necessarily spell the end for Microsoft, but it is certainly a world where the significance of Microsoft Windows and perhaps Office is greatly diminished. Hence the firm’s huge change of direction over the Internet since it became clear that Windows PCs would be a clear minority of Internet access devices in the medium term. We hear anecdotally that over half of Microsoft’s employees now work on online services – but is it too little, too late? Will Microsoft manage to survive all this? We could say that it all depends on time to market and quality of execution (of the new stuff), and speed of decline (of the old stuff). My gut feeling is that Microsoft will be reduced to a bit part player, and probably snapped up by another key player that wishes to integrate Microsoft’s technology more closely with their own services. My intuition is that this has nothing to do with timing and quality, it’s simply that Microsoft are now largely perceived as a“tired” brand – remember the ridicule that greeted Bing and Zune? This is ironic given that it comes at a time when the firm is doing some of its most innovative work, such as the Metro user interface. At least there is a silver lining for Microsoft if this comes to pass, in that VEDC licenses will still be required for those remote virtualized Windows apps, and don't forget that most Android vendors have reached a settlement to pay Microsoft a fee per device sold. These relationships are shown in the graph below, from an article by Devindra Hardawar in Mobile Beat. At a reputed 1m device activations per day, that's quite a revenue stream. My money is on Facebook to buy Microsoft, as the two firms have already flirted in a number of areas (e.g. Docs.com), and Office365 forms a strategic asset that a cash rich firm could buy rather than having to develop its own equivalent. Let's say that Facebook buy Microsoft. This will provide them with a true competitor to Google Apps, which will become increasingly essential as the firm loses users (and hence potential advertising revenue) to other services such as Google+, and has to rapidly devise an alternative business model in order to remain viable and avoid becoming another Myspace. Is this really going to happen, or am I just perpetuating Fear, Uncertainty and Doubt? Consider "frictionless sharing" through the Open Graph protocol, as discussed in the video below. Is sharing your life to this extent a step too far? Still comfortable using Facebook now? It's easy to see why a lot of people have been deleting their Facebook accounts. With Facebook’s chequered record on privacy, it will not be an obvious platform for corporate communication and collaboration. Hence I predict that Facebook (another brand which is already being referred to as “tired”) _will_ suffer the fate of Myspace, and in turn its own assets will be sold off to one of the three remaining key players. If the PC is dead, and Microsoft are mortally wounded, then who curates your IT experience? I suggest that there are three firms today which will almost completely dominate both consumer and corporate IT in five years time. They are Apple, Google and Amazon. These companies have some key characteristics in common, principally a long term vision and strategy, and a focus on execution. The details of their strategies have to remain a closely guarded secret, of course. Will a University be able to fulfill all of its IT requirements though a single one of these suppliers? I think this is unlikely in the medium term (less than say 5 years), because there are a plethora of third party vendors of best-of-breed systems in niche areas (or with special adaptations for the education market) such as Finance, HR, Student Records, Library Systems, Learning Management Systems (aka Virtual Learning Environments or VLEs) and so on. However, there are a swathe of applications around communication and collaboration that Google Apps and Office365 address right now, and some of them (such as the VLE) are fairly low hanging fruit. Remember when you had a friend or neighbour who was the IT expert - or perhaps you were that friend or neighbour! The person who knew how to recover a deleted file, set up a printer driver, configure the wireless network. Now we’re all (I exaggerate slightly for effect) “Home CIOs”, often with as many wireless devices in our houses as a small business might be expected to have PCs. Have we all suddenly become IT experts? I don’t think so, but our general level of computer literacy certainly has increased – at the same time as computers themselves have become easier to use and to maintain. But there is a sting in the tail - if the device is (say) a Chromebook or an Android tablet, then we can use our corporate Google Apps accounts, which can trivially be linked with our own identity management systems. The same does not apply if the device is from Amazon or Apple, although Apple have already provided a "Shibboleth-alike" facility in the form of the iTunesU user authentication subsystem. This might all seem quite negative and threatening, but I don't think it needs to be - provided that we are ready, willing and able to adapt our ways of working to these new paradigms. In my Cloud Computing lecture I identified a number of new opportunities for Computer Scientists around cloud computing, and in reality I think we are about to enter one of the most exciting periods yet for anyone working on Internet technologies or enterprise IT. But what do you think? Leave a comment on this blog post and let me know! I could well be a grumpy old man but I'm still very attached to my beige box. I know where my files are that way and whilst I'm not quite the tinfoil hat wearer that RMS comes across as, he has a point about handing over the keys to our data when we trust the cloud. I'm happy to use cloud services, but not ready to rely on them yet. Am I an "oldthinker" or do fools rush in where angels fear to tread? I'm excited by the prospects of this new personal computing paradigm - but probably a bit too cautious to jump straight in.